The legend that is Sir Richard Branson turned the grand old age of 60 in July and to celebrate his birthday he decided to try and set a few new World Records, as you do! 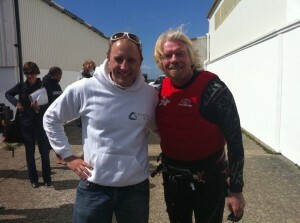 This is the man that is no stranger to word record breaking challenges – from the attempts in the 1980’s to make the fastest Atlantic Ocean crossing (his first attempt in the “Virgin Atlantic Challenger” led to the boat capsizing in British waters and a rescue by RAF helicopter), attempts to circumnavigate the globe by balloon, crossing the English Channel from Dover to Calais in an amphibious vehicle and bizarrely In March 2010 trying for the world record of putting a round of golf in the dark at the Black Light Mini Golf in the Docklands Melbourne. This time Branson planned to kitesurf across the English Channel with his son, daughter and various other kitesurfing friends (including 5 x World Champion Arron Hadlow and Course Racing World Champion Stef Bridge) breaking three records while doing so (largest group of kitesurfers to cross the Channel, oldest person to kitesurf across the Channel and the fastest kitesurf crossing of the Channel). I was onboard to film and photograph the event for Virgin and I was honoured to be invited to take part in a record breaking challenge! Conditions were favourable on the first attempt on 24th August. The attempt started well and the party were 5 miles into the crossing before safety concerns forced the group back. 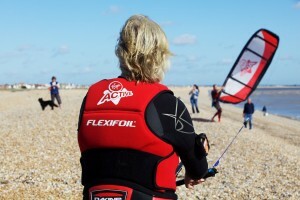 Whilst the conditions were favourable for the kitesurfers, the Channel swell was getting too large and the wind too strong for the safety boats to continue. Frustrated, and after some heated discussions, Branson turned back. A second attempt was made the following day, but in true British style the weather changed completely with barely a breeze blowing on the coast at Dungeness. Just after lunch the attempt was called off and Branson took us all for chips and a pint as an alternative to the vino and frogs legs that were waiting on the beach in France. I look forward to covering the next attempted crossing, hopefully within the next four weeks – thanks must go to Virgin Active and of course, Sir Richard Branson – an absolute legend. 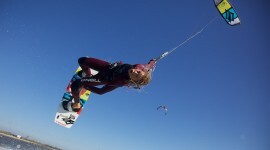 This entry was posted on Sunday, August 29th, 2010 at 2:41 pm	and is filed under Photography and tagged with branson, flexifoil, kitesurf, kitesurfing, mystic, Photography, richard, videography, virgin. You can follow any responses to this entry through the RSS 2.0 feed.